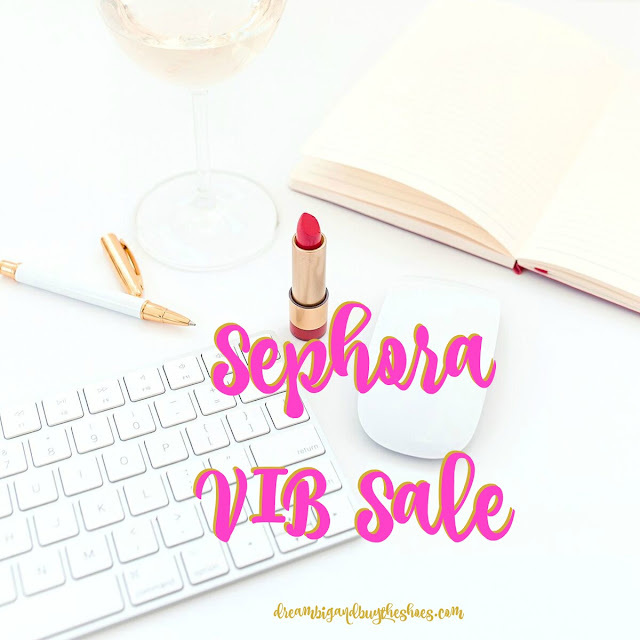 Dream Big & Buy The Shoes: Sephora VIB Sale- Prepare Your Purchases! Sephora VIB Sale- Prepare Your Purchases! It's the most wonderful time of the year- the Sephora VIB Sale starts soon! The Sephora Spring sale starts Friday April 13th and runs through Monday April 16th. Rouge members get to shop first during these 4 days and receive 15% off! Use code: YAYROUGE for your discount. VIB card holders can shop from Friday April 20th to Monday April 23rd and also get 15% off the purchases and Beauty Insiders can also shop these days and receive 10% off. VIB peeps use code: YAYVIB for 15% off and Beauty Insiders use code: YAYINSIDER for 10% off. Add things to your cart NOW- this way you have the best access when it comes time to shop and get what you want. Go through your stash at home and see what you need- it's a good time to stock up on necessities. Evaluate popular items that everyone may be after and add a few to your cart so if your first choice is sold out you can still maybe get your second choice. Check out the sale section- always great to get things on a sale with a coupon...huge deals! Sephora Favorites-LashStash To Go- mascara is my favorite beauty product, so this collection is always a great way to try some new ones in the mini size! Sephora Collection Contour Blush Palette- I'm in need of some new blush and the Sephora brand always kills it with great quality things for an awesome price-tag. These colors are beautiful! Stila Huge Extreme Lash- Purchased this a few months ago and absolutely LOVE it- so I'm going to buy another to have on hand for when I run out. Laneige Lip Sleeping Mask-Last VIB sale I purchased this with the eye mask in the mini kit- nothing makes my lips feel this good. Such a great mask- apply to your lips before bed and sleep...by morning they are so soft. Drunk Elephant Luxury Facial Oil- I have only tried a few samples of Drunk Elephant brand, and so many of the reviews are great for most of their items. Facial oils are really good for your skin, and this one sounds like something I need. Stila Stay All Day Waterproof Eyeliner- my favorite go- to...can't ever be without it! Sephora Collection- Miniature Eyeshadow Palette- I got this right after Christmas after reading so many good reviews and it being a dupe for some great Too Faced palettes. I have the Donut Shades already, and want the Cookie Shades too. Can't beat it for only $10- it's awesome. Do you have your eye on anything for the sale?! Tell me what's on your list!